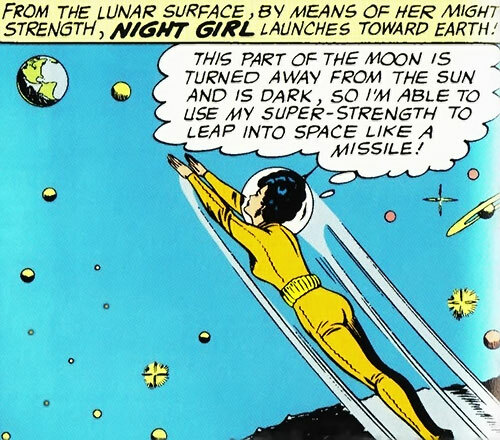 Night Girl is a member of the Legion of Super-Heroes, DC Comics’ far-future youth league. This profile focuses on her early career. 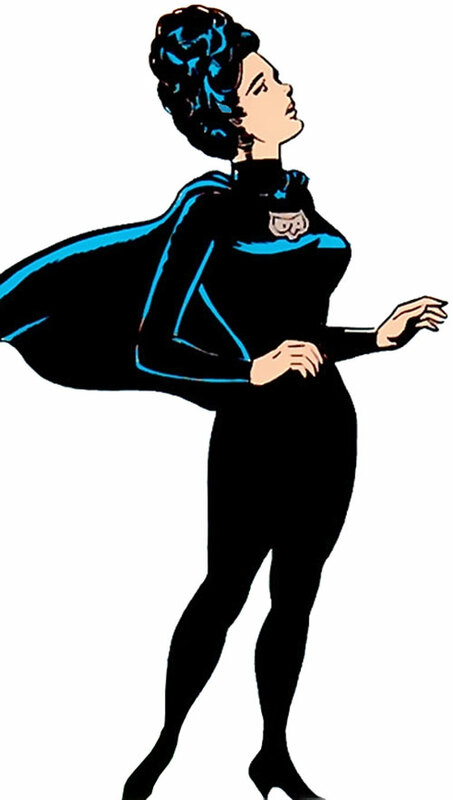 These are her Silver Age appearances in Adventure Comics (1963-1968). This profile will eventually be followed by a Night Girl (Classic) profile. For now you can make do with our older, more generic Night Girl (Pre-Reboot) profile. I kept her History brief, as the Subs major cases are covered in the separate profile for the Legion of Substitute Heroes. Thus, you should first read the Subs’ profile for context. Group Affiliation: Legion of Substitute Heroes and thus the Legion Reserve. Base Of Operations: 30th century Earth (Metropolis). Height: 5’10” Weight: 120 lbs. Night Girl has super-strength “which only Superboy or Mon-El can top”, putting her at more-or-less Kryptonian power levels. While nowhere near invulnerable, she can also take a lot more punishment than a non-powered human being. However, her strength and durability drop to normal human levels when she is exposed to direct sunlight. She is able to use her super-strength during the day if she is in deep shadows. Likewise her strength functions indoors under artificial light. Presumably someone could build comic booky solar-powered lamps which mimic solar wavelengths, or something, and deplete her strength that way. Moonlight and starlight are too weak and distant to have any effect on her. Ultraviolet radiation does not seem to power her, despite the fact that she’s powered by sunlight. Her strength allows her to tunnel through earth and rock with ease. It’s a tactic she uses frequently since there’s no sunlight underground to sap her strength. She also hollowed out a mountain for the Subs to use as a headquarters. Night Girl is so strong she can achieve escape velocity with a single jump, hurling herself like a missile into space. She once travelled from the Moon to the Earth (and back again) in a remarkably short time by leaping into space, presumably using her flying belt to steer. As a native of Kathoon, a world where it’s perpetually night, Lydda can see in the dark. Presumably this is some surgical alteration or medically induced mutation common on Kathoon. Lydda’s father is Kathoon’s most expert scientist, and the United Planets is an advanced technological civilization. She’s not really a scientist herself, but she seems to have a well-rounded technical education. She can make basic use of Legion equipment and spacecraft and helped build the Subs headquarters and spaceship. Lydda has a Legion-issued anti-gravity Flying Belt. 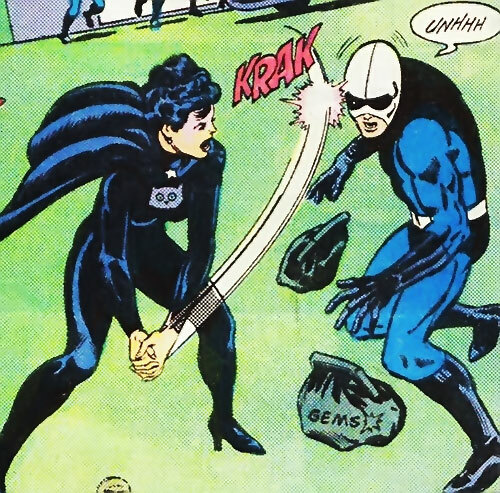 And she once used “shadow bombs” similar to Dr. Mid-Nite’s blackout bombs. Night Girl is the daughter of one of the most renowned scientists of Kathoon, a planet with no sunlight. Apparently Kathoon is distant from its sun but is heated by geothermal energy. 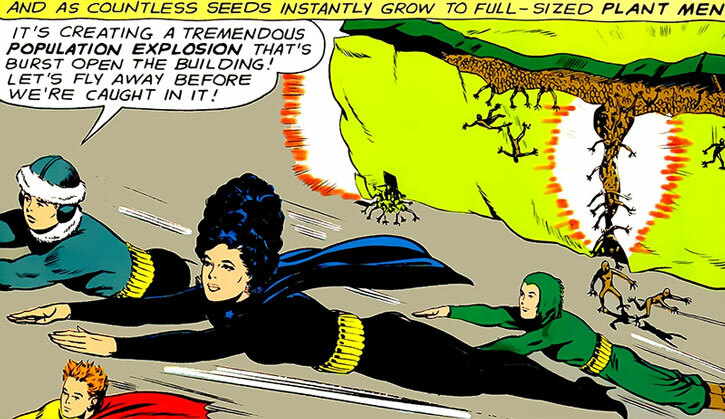 Lydda, like most teens of her generation, was a huge fan of the nascent Legion of Super-Heroes (LSH). 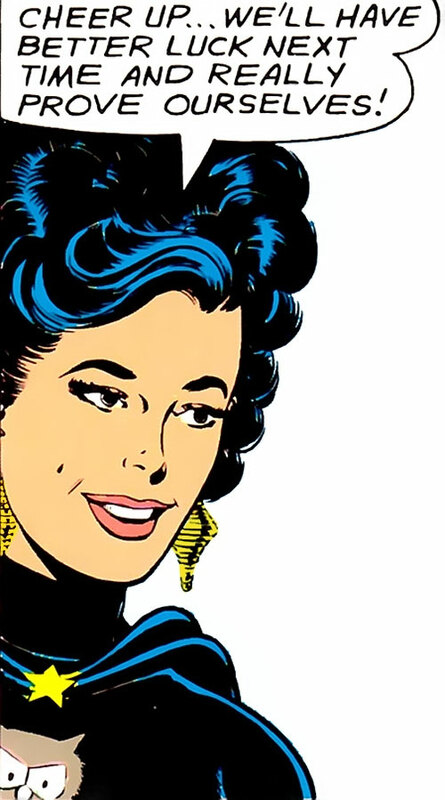 She developed a secret crush on Cosmic Boy, the Legion’s first Leader. 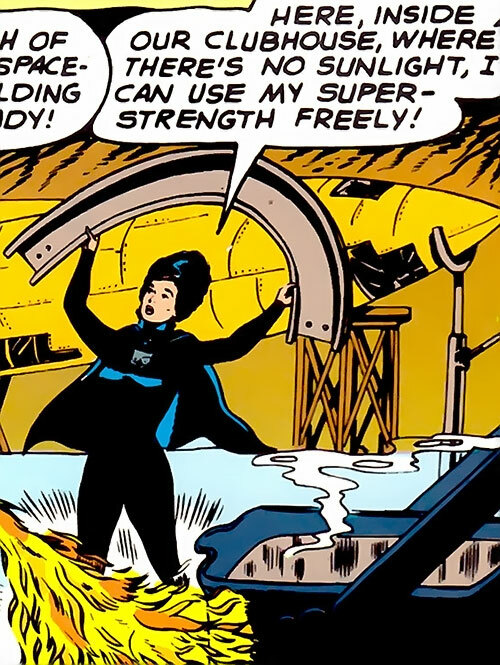 When she asked her father to help her develop superpowers that would qualify her for Legion membership, he created a vitalizing ray which gave her super-strength. Though the vitalizing ray was successful, she only possessed her strength in darkness or in artificial light. Sunlight returned her to normal. She gamely applied for Legion membership despite her limitations, but was rejected in one of the Legion’s periodic open calls. Night Girl felt shattered by the loss of her dream, but rather than dwell on her own pain, she reached out to other rejectees to offer condolences and encouragement. One of those rejectees was Polar Boy. Inspired by meeting her, he came up with the idea to form a second club of lesser super-heroes. 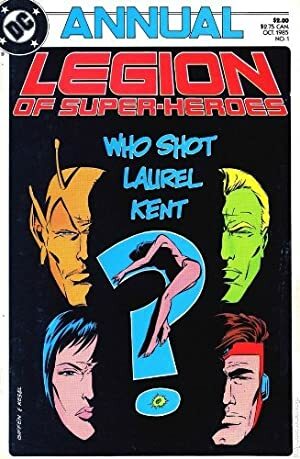 This group would not compete with the LSH, but would stand by to help when needed, or to fill-in if there was a need while the Legion was busy elsewhere. Lydda took Polar Boy to meet some of the other rejected applicants she’d met, and the Legion of Substitute Heroes was born. Initially, the Subs kept their existence secret, wanting only to be a secret auxiliary to help out their heroes. In their first case, they repelled an invasion of alien plant men which the LSH and other authorities had overlooked. During their second case, aliens captured and impersonated the LSH members and planned to loot Earth of its mineral wealth. When the Subs interfered the faux-Legion declared war on them, trying to force them to disband and sending them on the run. Night Girl, sure that Cosmic Boy could be trusted, snuck away from her teammates to meet with him and get his help. She trusted his promise that he wouldn’t track her back to the other Subs. Of course, the imposter did so. Ultimately the Subs dispatched the imposters and freed the real Legionnaires from the space-warp they were trapped in, all without revealing their existence. Soon after this, the girl Legionnaires began falling ill to a strange “crimson virus”. Night Girl went to the Legion to offer her services as a nurse, again keeping the existence of the Subs hidden. The crimson virus struck Night Girl too, and she was taken to Quarantine World along with the Legion ladies. The virus turned out to be an attack by Satan Girl, an evil doppelgänger of Supergirl. Following Satan Girl’s defeat, Night Girl secretly went back to the Subs. But inevitably, the Subs’ activities came to the attention of the LSH. 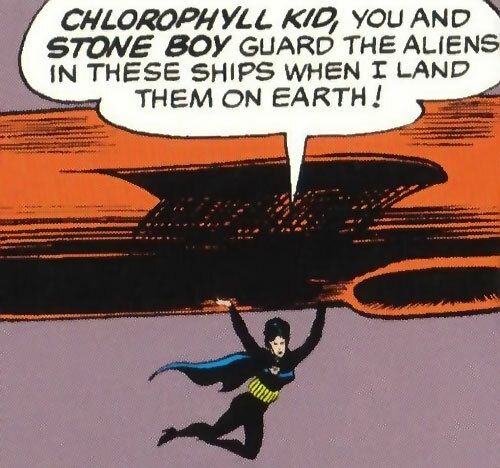 It was Superboy who spotted them defending Earth from raiders while the Legion was away. The Legion was touched by the Subs devotion to them. They encouraged them to keep operating, and to show how impressed they were, held a contest between the various Subs. The winner of the contest would be admitted to the Legion. 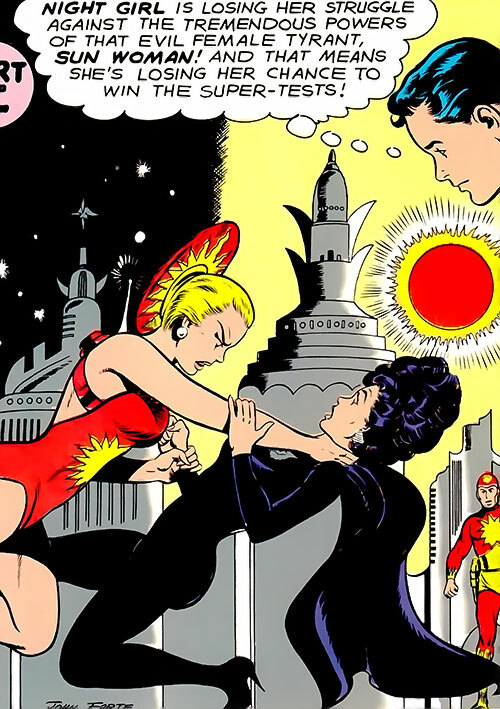 Sponsored by Superboy, Night Girl’s test was to bring the dictator of Vannar, a villainess called Sun Woman, to justice. Vannar was a world which did not revolve and so had a daytime half and a nighttime half. Sun Woman had a solar-harness which drew energy from the sun to give her super-strength. This made her practically unbeatable on the constantly lit side of the planet, where she had taken over. Night Girl intentionally got herself arrested so that she’d be thrown in prison. Once there, out of the sun, she was able to tunnel out and visit covertly with the citizens. Lydda got them to burn mass quantities of a rock (possibly coal?) that blanketed the sky with thick black smoke. This blocked Sun Woman’s strength and gave Lydda freedom to use hers above ground. Night Girl captured Sun Woman with ease. Ultimately, she tied Polar Boy for second place in the contest. Stone Boy won – sort of – but decided to stay in the Subs with his friends. Shortly thereafter, the entire Legion was defeated during the attack on the Citadel of Throon. The Subs went to their rescue, even though they figured it was a suicide mission. While her teammates launched a futile frontal assault to draw attention, Night Girl was shot from a missile-launcher to the dark side of Throon. She drilled through the planetoid, up through the citadel’s dungeons, and to the control center of the citadel, which she destroyed, saving both teams. 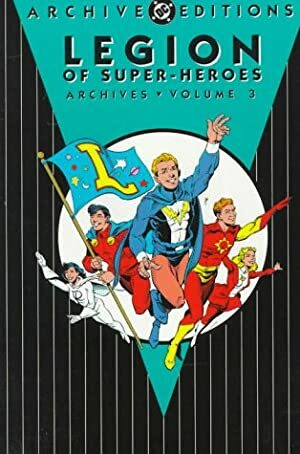 When the heroes returned to Earth, the Legion of Substitute Heroes were honored with a parade down the Avenue of Heroes, giving them their first public recognition. The Legion the Subs an independent branch of the Legion Reserve, and began calling on them semi-regularly. They assisted against the Time Trapper, the Legion of Super-Villains, super-powered spies from Murra, the Taurus Gang, and others. The Legion began referring rejected but worthy applicants to the Subs, and Color Kid joined the team. As the two groups met intermittently for talk and training, Night Girl finally had the chance to get to know Cosmic Boy. It took quite some time, but eventually they began dating and developing a serious relationship. Lydda is a beautiful, curvy woman with jet black hair, pale skin, and blue eyes. She’s quite tall, though the height listed above is her full adult height. In her mid teens, early in the Silver Age, she’s a couple of inches shorter. Her very high bouffant “beehive” hairdo more than makes up the difference! Her costume is a dark black, full body costume with a stylized owl’s face emblazoned on the chest. She wears a black half-cape which is secured at her throat with a brooch shaped like a five-pointed star. She usually wears dangly earrings. At this stage in her career, Lydda is a dreamy romantic with stars in her eyes. She longs for excitement, developed a crush from afar on Cosmic Boy, idolizes the Legion as a whole, and longs to join them. But though she’s starstruck, she’s not after fame and glory. Lydda’s a genuinely good and kind person. She goes out of her way to comfort and defend those in need, and she really believes in the ideals of the Legion. That’s probably why she became infatuated with Cosmic Boy, when most girls of her age were apparently drawn to the flashier Sun Boy, or the legendary Superboy or Mon-El. 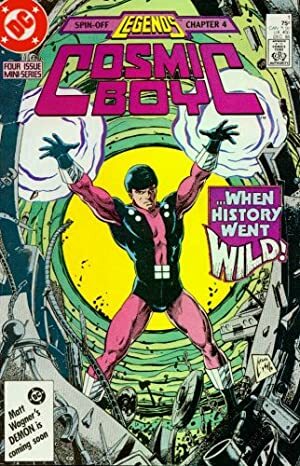 Cosmic Boy was the first Legion Leader, a founder and spokesman, and he had no rival in Night Girl’s eyes. Even after being rejected by the Legion, she stayed committed to the idea of doing good with her powers. The rejection, and her very real weakness to sunlight, seems to have left her with some feeling of inadequacy. She’s constantly pointing out the limits of her powers, and for a long time she’s content to quietly pine over Cosmic Boy, never speaking up about it. Of course, both these things are typical of Silver Age comics, so it’s more a comment on writers than a defect in her personality. But she’s also determined and resourceful. She’ll find ways to work around her limits and still get the job done. Sometimes her self-doubt and her longing to be noticed by Cosmic Boy do add a grim element to her otherwise hopeful optimism. She’s almost desperate to prove herself. Jumping and Tunneling are both Derived from Strength (-1 each). Ultra Vision only to see in the dark (-1). Area Knowledge (Kathoon), Confined Headquarters (the Subs’ mountain base). 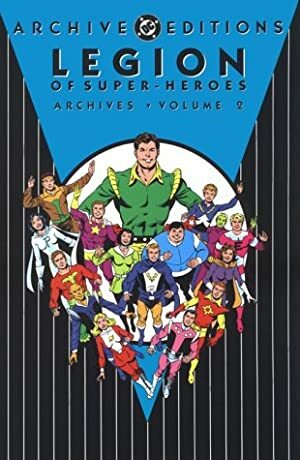 Legion of Substitute Heroes (High), Legion of Super-Heroes (Low). MIA toward Cosmic Boy, Power Loss (when exposed to direct sunlight, Night Girl’s STR and BODY drop to 03). Legion FLYING BELT [BODY 05, Flight: 08, R#03]. The existence of the Legion of Substitute Heroes was initially a secret. 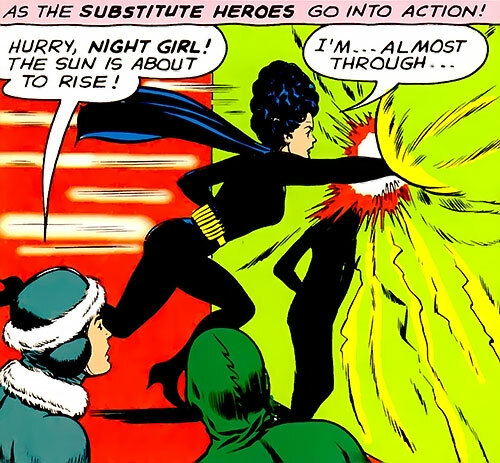 During their first few cases, Night Girl and all of the Subs had the Secret Identity Drawback. Note that Night Girl, at least, still had a Low-level Connection to the LSH, having nursed the female Legionnaires during the battle with Satan Girl, as noted in her History. Source of Character: DCU (Adventure Comics, Action Comics). Helper(s): John Colagioia, Civafan, Mayfair Games’ Legion Sourcebook v.1, the 2995 LSH Sourcebook by Mayfair, the Silver Age Legion site , Sébastien Andrivet, zoomjunkie. Writeup completed on the 25th of September, 2013.